Image courtesy of With PayPals like this, who needs enemies? With PayPals like this, who needs enemies? As we’ve mentioned before, eBay recently changed its terms of service to include a mandatory binding arbitration clause that effectively takes away customers’ rights to pursue class-action lawsuits against the company. So it should come as no surprise that eBay subsidiary (and perennial Worst Company In America contender) PayPal has added a similar clause to its user agreement. But just like the eBay clause, users do have a short window to opt out. YOU AND PAYPAL AGREE THAT EACH OF US MAY BRING CLAIMS AGAINST THE OTHER ONLY ON AN INDIVIDUAL BASIS AND NOT AS A PLAINTIFF OR CLASS MEMBER IN ANY PURPORTED CLASS OR REPRESENTATIVE ACTION OR PROCEEDING. 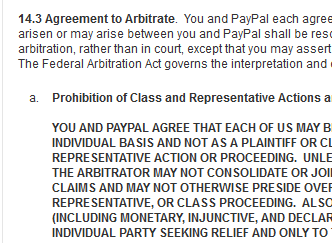 UNLESS BOTH YOU AND PAYPAL AGREE OTHERWISE, THE ARBITRATOR MAY NOT CONSOLIDATE OR JOIN MORE THAN ONE PERSON’S OR PARTY’S CLAIMS AND MAY NOT OTHERWISE PRESIDE OVER ANY FORM OF A CONSOLIDATED, REPRESENTATIVE, OR CLASS PROCEEDING. ALSO, THE ARBITRATOR MAY AWARD RELIEF (INCLUDING MONETARY, INJUNCTIVE, AND DECLARATORY RELIEF) ONLY IN FAVOR OF THE INDIVIDUAL PARTY SEEKING RELIEF AND ONLY TO THE EXTENT NECESSARY TO PROVIDE RELIEF NECESSITATED BY THAT PARTY’S INDIVIDUAL CLAIM(S). ANY RELIEF AWARDED CANNOT AFFECT OTHER PAYPAL USERS. In response to the eBay TOS change, the folks at Public Citizen wrote the company asking it to rethink this anti-consumer practice of slipping forced arbitration clauses into long and complicated user agreements. Citizen.org has a Rogues Gallery of companies with forced arbitration clauses, many of which have jumped on the bandwagon since the U.S. Supreme Court ruled in favor of AT&T in 2011 that a couple of sentences buried among thousands of words in a user agreement — a user agreement that can not be edited or contested if the customer wants service — is sufficient to pre-empt customers from joining in a class-action suit.